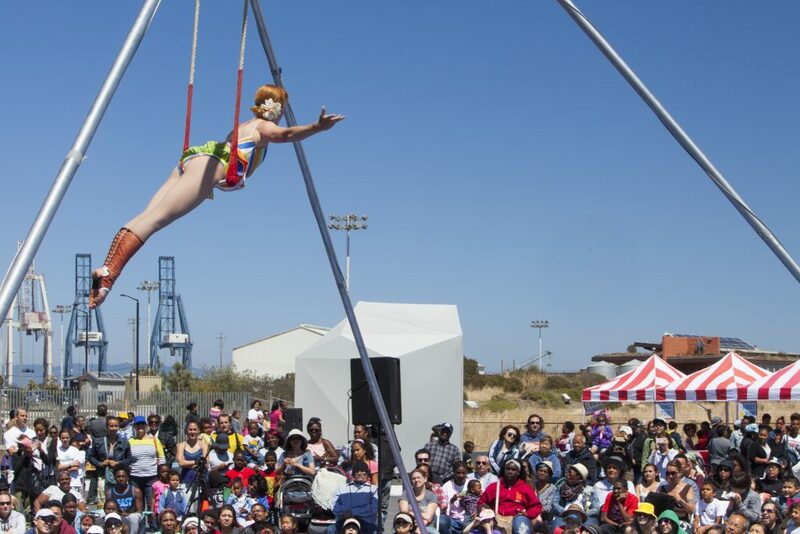 Doors to this free family-friendly event will open at 12pm and event goers will be able to enjoy a myriad of activities from hobnobbing with stilt walkers and eating treats from local food vendors to riding the giant Fun Slide and playing circus games. There will also be interactive activities that engage the public in conversations about the future of the site. The Circus performance will begin at 1:45 pm, opening with the Prescott Circus Theatre, a non-profit organization aiming to empower and engage youth through circus and theater arts education. Prescott Circus Theatre, which offers circus instruction free of charge and almost exclusively to low-income children, will feature an exciting array of young performers. Following the Prescott Circus Theater, Circus Bella, an open-air contemporary circus that uplifts diverse audiences and engages community, will present their most recent production “Bay City Rhapsody.” This production translates the magic of daily city life into circus infused with the poetry, live music, and comedy using static trapeze, rope walking, a 9-person juggling act, contortion, hula hoop, original clowning, a live band playing originally composed music, and more.